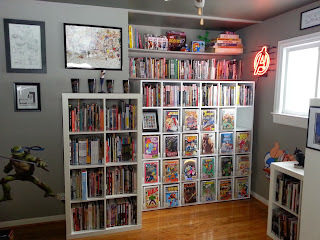 For at least the past decade -- probably a bit longer than that -- I have wanted to build a comic book library for myself. A room that housed not only my comics and graphic novels, but also all of my books and resources about comics; and also have the room serve as a workspace. I wanted to be able to write and research back and forth without having to do any more than take a few steps across the room. I'd tried doing it on the cheap in my last house, and I was able to make my collection more personally accessible, but I was still resigned to doing my writing elsewhere. In my new house, I've been able to really design it to suit my needs and it's already working exactly how I hoped it would. This week, I've gotten all the major components in place, and I thought I'd share something of a tour. First, here's my main workspace. I've got my computer and microfiche reader side-by-side, and all of my reference books about comics and comic creators right there. (They still need to be alphabetized, though.) Right underneath my microfiche reader is a portfolio of original art that I don't have room for on the walls. 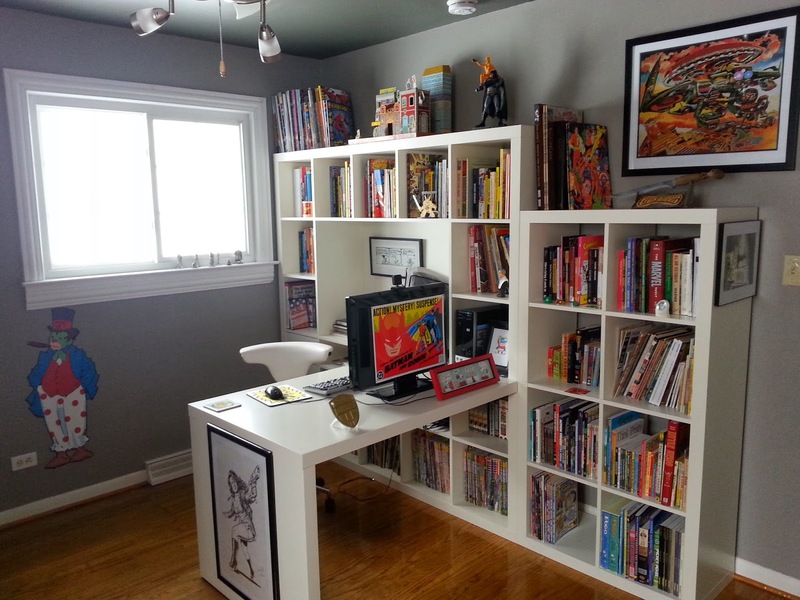 The smaller bookshelf on the right has books on comics fandom and my meager collection of comic strip reprints. 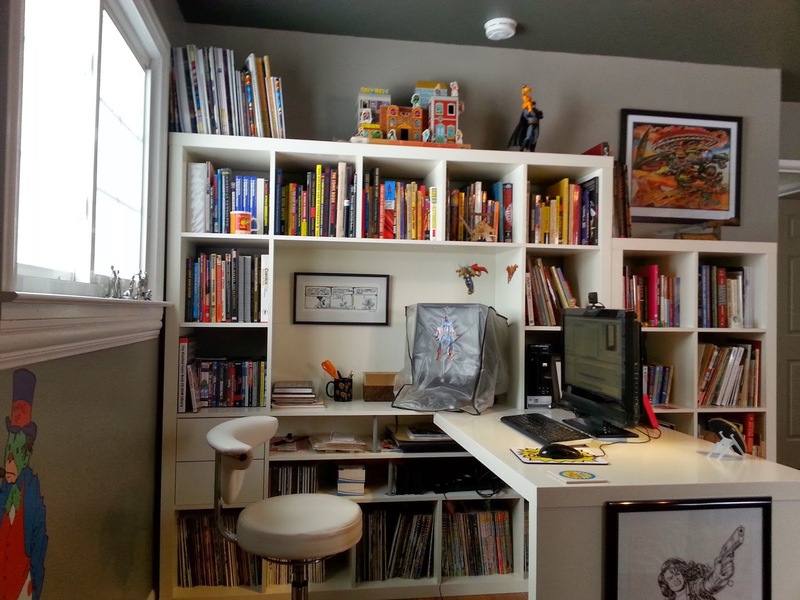 On the other side of the room is the bulk of my comics collection. 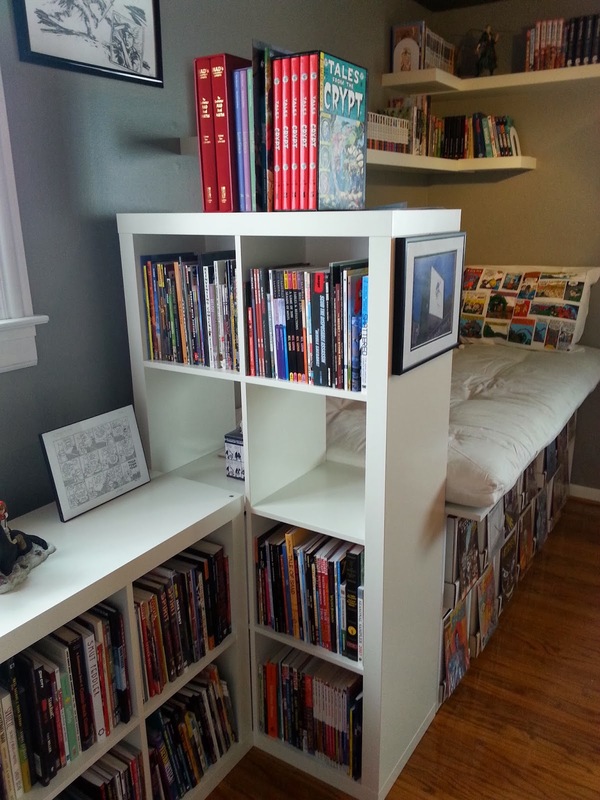 The graphic novels are stored in standard Ikea bookshelves, but I had a carpenter build specially designed shelving units for my long boxes. It's a pretty straight-forward cubbyhole type of design. And in the middle is a custom-built daybed sitting atop more longbox shelving. There are some more 'regular' shelving units on one end with some floating shelves on the wall above for my manga. I put together this video of the progress I made in building my library. At the end, you can see a single, continuous pan of the entire room. There's still some work that needs to be done, primarily some rewiring for the lighting. But I have really been enjoying it so far, almost to the point where it's difficult to get any actual research or writing done in there! But I'm sure once I get used to having it -- it has been something I've been wanting for over a decade as I said -- it will function exceptionally well for me. But yeah, those random posts and Tweets and such over the past year or two where I've talked about wanting to do this? This is exactly what I was hoping to accomplish! Big, big, big congratulations. I'm in awe! sorry I missed this when you first posted it... the library looks fantastic! May I ask how much that custom longbox shelf set you back? Hi, Natasha. 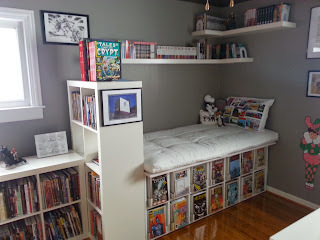 I paid for the longbox shelf and the longbox/day bed combo pieces together, so I can't say how much each cost individually but both of them together were a little shy of $2000. Not cheap, certainly, but it was less still less expensive than any other existing comics furniture I've seen to hold the same number of comics. 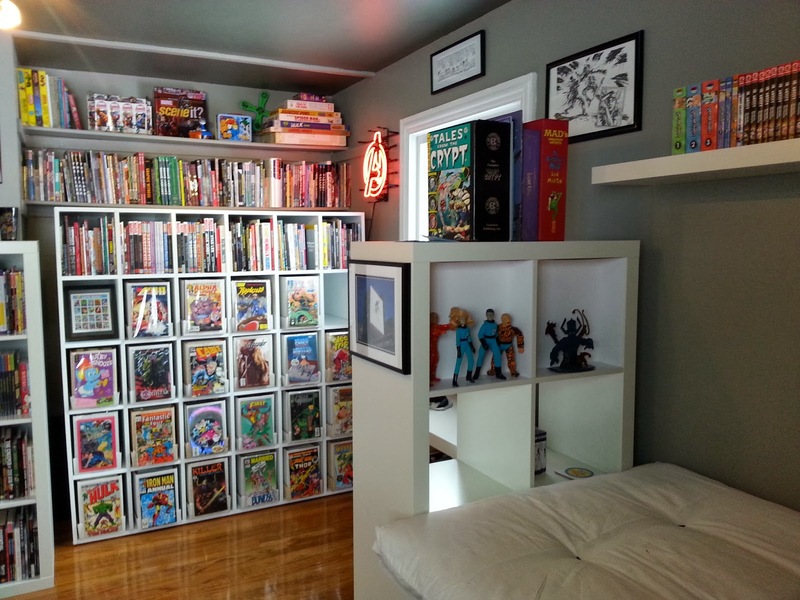 "How do you acclimatise your room to your comic collection?" Cos I do not see any dehumidifier in your set up. Is it necessary in your situation? I spent some time measuring the humidity in the room before moving my comics in. It stays pretty dry in the room already, so a dehumidifier is not necessary. I finally have a permanent space to house my collection. I really like the long box shelving and have had the same idea to remake my (non-used) closet into a display area. Can you provide teh build schematics for the shelving or, at least, a parts list? Unfortunately, I can't. I hired a carpenter to do the work and basically said, "Here are the dimensions of a long box. 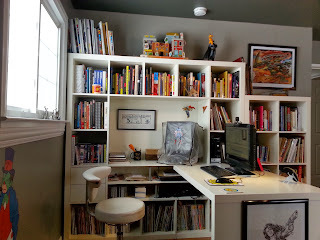 Can you make a unit that holds six columns and five rows of long boxes to fit in this closet space?" He choose the materials and figured out all the construction. All I did was pay for it. Hi Sean! I've admired what you did with this room for some time and am imitating many things you have done in my own room. 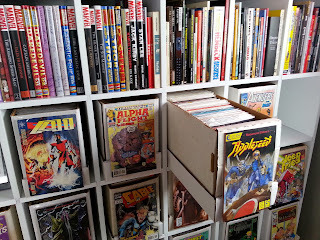 I've opted to switch out my long boxes for shorts ones so I could use the larger grid of Ikea shelves like what you used for your graphic novels (save $ vs custom building.) I was curious what color you painted the walls though? It looks grey in the pictures but the windows wash out a lot of the color and make it hard to tell. I am thinking to go a similar route but I don't want to go too dark that it makes the room feel smaller (it's only 11'10"L x 6'6" W x 7' H) nor too light that my wall art doesn't "pop" against the contrast of color. Thanks! Hi, Justin! Glad I was able to provide some inspiration! The walls are about as medium a grey as I could get. The ceiling is a dark grey, about halfway between the walls and black. I deliberately wanted to keep the room itself as neutral as possible because I knew displaying all the comics and art and everything would be a huge sea of colors in the first place; adding additional colors on top of that seemed to me like it would induce visual stress. That's also why I made sure to keep all the furniture white. I considered just using IKEA shelving for everything as well. (My initial plan was to have two units back to back, and then run the long boxes through both.) I did some calculations, though, and for the number of shelves I needed, it wasn't that much more expensive to get them custom built. Since the custom ones would also fit better in the room, I erred on the side of those. My guess is that I was right about at the tipping point, though -- any fewer shelves and it would've been cheaper to go with IKEA and any more, it would be cheaper to go custom. I'd love to see what you put together whenever you get finished! Congratulations, one of the best comic libraries I've ever seen. Well done! I have a question about the organisation. With that many comic books, do you arrange them alphabetically or by some other arrangement? And do you use a database to manage your collection? Just curious because I have a much smaller collection (around 7,500) and find it tricky to keep track of where everything should be stored. I've added a custom field in my database software (CLZ) for the box number, but I have only had minimal success. I find it frustrating with so many crossovers and big 'events'. Any way, thank you for sharing your photos and documenting the process. Very useful and inspiring. Sorry for the delayed response; I've been a bit out of pocket the past couple months. 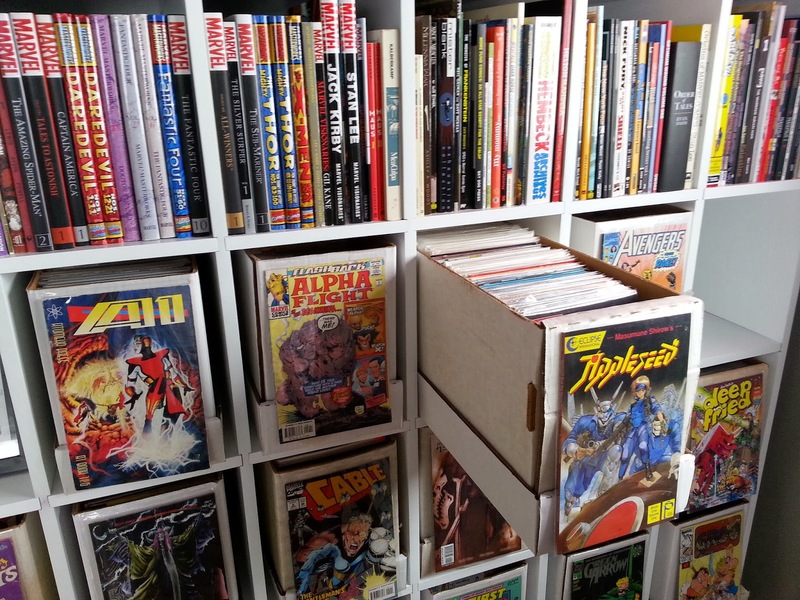 The comics are all arranged alphabetically by the official title in the indicia. Then, on the front of each long box, I display the first issue in that box. So, for example, in the photo where you can see the "Appleseed" book? "Astounding Tales" would be later in that box, but "American Flagg" would be in the box before. As far as databasing goes, I use Comic Book DB. In looking back at your room for additional inspiration, I noticed something that I hadn't before. You have a LaserMach Fantastic Four statue. I have accumulated a large collection of their Marvel laser etched pieces including that one. The reason that I point that one out is because I have a question about yours. Does the Invisible Woman have a Lucite bubble around or behind her on your display? I saw a picture online once that seemed to show one, but mine does not and I was curious if I was missing it on mine, or if maybe someone had added one in the picture I previously saw. I know exactly what you're talking about regarding the FF LaserMach statue. I remember wanting one when they first came out, and not being able to afford it at the time. (Again with the not being made out of money thing!) The picture you're thinking of is, I believe, an initial promo shot before it was actually manufactured. I've seen maybe a half dozen or dozen actual pieces on eBay over the years, and none of them have ever had that force field bubble. My guess is they had problems getting that to work properly and dropped it for their production run. Given the rest of the unit's construction, I suspect getting that Lucite to stay in place would've been difficult and clumsy at best without redesigning the basic structure of the whole piece.